Enter the stated nominal or annual interest rate of the investment, without the percent sign (for .045 or 4.5%, enter 4.5). Select the compounding frequency that applies to the investment. Typically, the more frequent the compounding, the higher the effective annual rate will be. Based on the entered nominal or annual interest rate and the selected compounding frequency, this is the calculated Annual Percent Yield (APY), which is also referred to as the Effective Annual Rate. This online APY Calculator will calculate the Annual Percent Yield, also known as the Effective Annual Rate (EAR), from a stated nominal or annual interest rate and a given interest compounding frequency. If you aren't familiar the APY, are unaware of how it compares to APR (Annual Percentage Rate), or you are not sure why it's important to know, it may be well worth your time to read the explanation provided under the Learn tab. Enter the stated annual or nominal interest rate. Select the applicable compounding period. 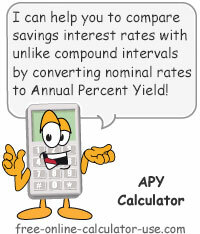 Tap the "Calculate APY" button. Compounding frequency refers to the number of times per year that the interest is calculated on an investment. For example if the interest is compounded monthly, the decimal equivalent of the interest rate is divided by 12 and then multiplied by the month-end balance of the account. Whereas for daily compounding, the decimal equivalent of the interest rate is divided by 365 and then multiplied by the balance at the end of the day. In all cases, the interest is then added to the balance in time to be included in the next compounding. That's where the power of compound interest comes in -- because you are earning interest on interest earned. What APY is, how to calculate it, and how it differs from APR. APY stands for Annual Percentage Yield, which is a formula used to compare stated interest rates that have different compounding periods. For example, if one saving institution offers an annual interest rate of 1% compounded annually, whereas another saving institution offers an annual interest rate of .95% compounded daily, these are considered to be nominal or stated rates and are not comparable (apples and oranges). This is where the APY formula (shown below) can be used to translate each stated rate into rates that can be compared (apples to apples). APY = (1 + r/n )n – 1 where r is the quoted annual interest rate and n is the number of times the interest is compounded per year. Of course, it will be much easier to skip the manual calculation and simply use the APY Calculator on this page. Easier yet will be to simply ask the savings institution to give you the annual percentage yield -- which they are required by law (Truth in Savings Law) to provide you with. APY = 100[(1 + Interest/Principal )365/Days – 1] where Principal is the amount of funds on deposit, Interest is the total dollar amount earned for the term of the principal, and Days is the number of days during which the interest was earned. The above formula is the one used by other saving and investing calculators in this section, such as the CD Rate Calculator and the CD Savings Comparison Calculator. APR stands for Annual Percentage Rate and is normally associated to mortgage loans that come with closing costs and origination fees. So whereas APR is typically used to translate different mortgage loan costs into comparable rates, APY is normally used to translate different compounding intervals of savings rates into comparable rates. It's important to note that APR is often used interchangeably when referring to non-mortgage interest rates as well, such as in place of nominal rate or annual interest rate. I know all of this jargon can be confusing (much to the pleasure of the savings and loan industry), but all you really need to remember is that when looking at two different advertised interest rates, if the rates aren't followed by the same label (APY, APR, etc. ), then further investigation is needed to make sure you are comparing apples to apples.